Many people rely on roofing companies when installing roof membranes or replace the roof of their houses in Ottawa Ontario. There are a variety of advantages that flat roofs can give your home. Currently growing homeowners are installing flat roofs and covered with roofing membranes or looking houses with roofs such as it is quite cheap compared to install angled ceilings. A smaller amount of material is used and labor costs are also reduced. The mark of a good company is in the testimonies of their clients and if this information is available then you should check it online, on twitter, facebook and linkedin if the comments are positive you can be sure that the company is credible. The customers are the concrete proof of service of a first class contractor in Ottawa. Read the entry here published on waterproofing of horizontal surfaces , flat roofs and terraces possible. The flat roof is characteristic of the modern house . Although there are modern chalet style houses with sloping roofs, the change in architecture leading to flat roofs and its use was effective as modern house design and modern buildings in the twentieth century. We are a local roofing company in Ottawa Ontario offering roofing, siding, foundation repairs and snow removal services. Feel free to call or email at anytime, if you need assistance or in need of consultation. We will be more than happy to assist you. It is always a better solution to solve your roofing related problems from the root cause instead of patching it here and patching it there. Temporary solutions are good to have but not if it accedes the expected budget. 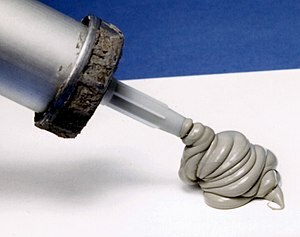 Number one temporary solution for every roofing company starts with a caulking gun. It works but for limited time only. It works but depending on the location of the problem. If the roof is still in ok shape and does not require replacement, it can be repaired in the mean time but if the roof is over 10 or 12 years it is highly recommended to replace the entire roof. Minor leaks can cause major damages to the roof deck, insulation in the attic and of course the interior walls. Paying high deductibles to the insurance companies is not a recommended method of saving but if your roof is always causing problems, replace it at your own cost not thru your insurance company. Insurance company policies are designed to hustle the citizens/society who owned a home, business or a vehicle. Be sure to get 3 estimates from multiple roofing companies to compare the differences. 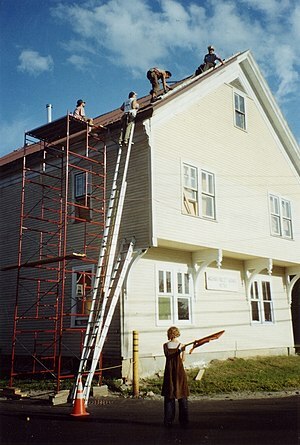 Understand exactly what is being offered by the roofing company in writing. Ask questions if there is any. If the price seems to good to be true, request another estimate from a different company. If the price looks too high, request another estimate from a different roofing company. Expensive or cheap does not guarantee quality. Ask a friend or family member for advice. We are a local roofing company in Ottawa Ontario offering residential roof replacements, commercial flat roof replacements, general roof repairs and new roof installations, repairs and sales in Ottawa and the surrounding region. Request your free roofing quotes by phone or email and we will be more than happy to assist you. After a rough winter the condition of your roof is determined by the amount of problems you’ve experienced during those cold winter days. It can be multiple reasons why you need to replace or repair your roof. Typical problems during winter can be water damage, heat loss, condensation and many other reasons. It is always in your best interest to hire an honest roofing company to inspect your roof and repair if necessary. If water found a way thru your pitched and/or flat roof, you have few options; inspect the roof yourself, research on the web or request 3 quotes from local roofing companies. Be sure to understand the difference between a contractor and company. Anyone can be a contractor but it requires more than an individual to operate a registered company. It may sound to you the same thing but actually it is totally two different things. If your heating bill was extremely abnormal, this is caused by heat loss. It can be caused by all the doors and windows, insufficient amount of insulation or roof is too old. It is always in your best interest to get an opinion from a local roofing company. Never wait for the last-minute, always be ahead of the necessary maintenance and repairs that maybe needed for your residential or commercial roof. Choosing the right roofing company is a key. You may end-up paying 10 to 20% more to a company that has too much overhead expense. As long as company is willing to provide all the necessary warranty and documentation to you on its own, you are in good hands. Request your residential and commercial roofing quotes and estimates by phone @613-255-2323 or by email 613roofing@gmail.com we will be more than happy to assist you. All estimates are free and we will work with your schedule to serve you better. This is the time of year where is all begins. Whoever had problems with their roof during this strange winter in Ottawa, Ontario should start to shop around and get different ideas from different roofing contractors. If you’ve experienced a bad winter where the ice dams caused water damage to your home or office repairing the problem is always a quick fix and it can happen again. Right thing to do is to solving the problem from the root cause. If ice dams were an issue, that tells you there isn’t enough ice and water shield on your roof deck to protect your home or office from potential water damage, mold, rotten plywood or even worst. Repairs are easy to do and its a fast cash that’s how i see it. If the customer insists on repairing the problem instead, i will not disagree but i would confront the customer about the similar issues that may occur in the near future. Age of the roof can be an issue also, after repairing the problem way too many times, even the repairs don’t work after a certain point. Make sure the company that is providing you the estimate gets on the roof and inspects the roof, measures the actual square footage. Anybody can “quesstimate” by looking at it from the ground. Make sure you get all the details in writing with all the product and warranty information. Ask questions if it is not clear. Always get 3 estimates and compare. Cheap does not mean quality. Expensive does not mean quality either. Look for the reasonable/fare price. We offer free quotes and estimates for pitched and flat roofs in Ottawa and the region. Request your free quotes and estimates by phone or email and we will be more than happy to assist you.